This is continuation of my previous post- Trip to Srirangapatna. 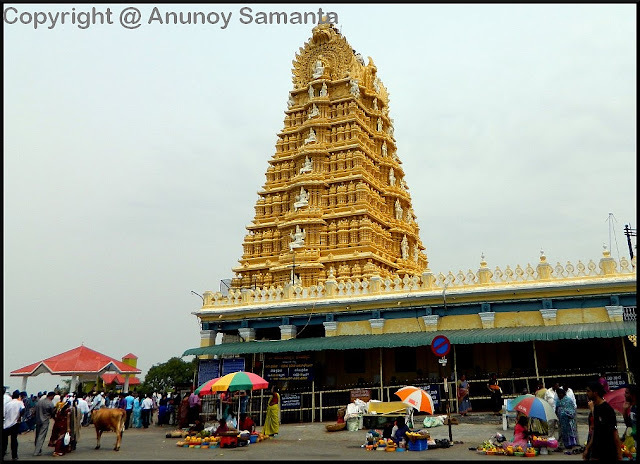 After our brief sightseeing at Srirangapatna we entered the ‘Palace City’ Mysore (renamed as 'Mysuru' on November 1, 2014), and headed straight to Chamundi Hill which stands about 13 kilometers away from the Mysore city. Chamundi hill (3,489 feet approx), apart from its religious significance has great charm among hikers and adventure lovers, as it gives a perfect panoramic vista of the Mysore city lying underneath. From the hilltop you can see the Lalitha Mahal Palace, Mysore Palace, Race course, Karanji lake, Kukkarahalli lake, St Philomena’s Church and many other important landmarks of Mysore while getting dipped in the fresh forest air and spirituality. Interestingly, Chamunda Hill has reference in the ancient scriptures like ‘Skanda Purana’. According to the legend, Chamundi Hill is the auspicious site where Goddess Chamundi (a violent form of ‘Shakti’), the tutelary deity of royal family of Mysore, had defeated the over-imperialistic powerful buffalo-headed demon Mahishasura and salvaged the terrorized people under his evil reign. In the historical background of Chamundi hill, the contributions made by three dynasties – Hoysala, Vijayanagar and Mysore rulers have been traced. On the top of the Chamundi Hill you can find the 1,000 years old Chamundeshwari Temple which is the main pilgrimage attraction of the place, as clearly evident from the dense crowd even in a weekday! On the top of the Chamundi hill you can find the 1,000 years old Chamundeshwari Temple, the main religious attraction of the place. Chamundeshwari Temple assumed its significance after the Mysore Maharajas, the Wodeyars, came to power in 1399 and worshiped Devi Chamundi with great devotion as their family deity. It was a small shrine initially and gradually assumed its importance over the centuries. Krishnaraja Wodeyar III repaired the shrine in 1827and built the present beautiful tower at the entrance. Blessed by the Goddess, an ardent devotee Krishnaraja presented to the temple a ‘Simha vahana’ and other animal chariots and jewels of great value. Those chariots are used even now for processions on special religious days. The present day Chamundeshwari temple has a quadrangular structure built in Dravidian style, comprising the main doorway, entrance Navaranga Hall, Antharala Manatapa, Sanctum sanctorum and Prakara. There are beautiful seven tiers of pyramidal towers at the entrance and a ‘vimana’. Atop the tower at the entrance, there are seven golden ‘Kalashas’. The tower at the entrance has a small image of Lord Ganesha on the doorway which is silver plated and has the images of the Goddess in various forms. As you enter inside you’ll find a small statue of Lord Ganesha on your right and as you enter farther, there you’ll come across a flagstaff, the footprints of Goddess and a small statue of Nandi facing the sanctorum. In the sanctum sanctorum you’ll find the stone statue of the Goddess ‘Mahisha Mardini’ with ‘Ashta Bhujas’ (eight hands) sitting in a powerful yogic posture. 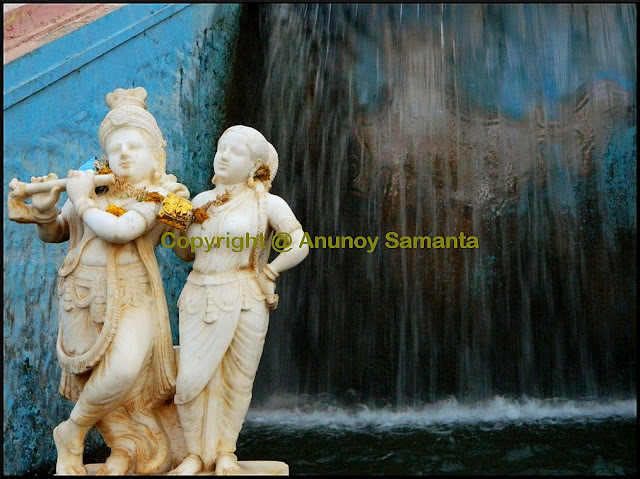 According to local myth, the image was established by sage Markandeya. So, obviously it boasts of a very old history! Idol of the Goddess is decorated daily and worshiped by priests as well as infinite devotees with coconuts, fruits and flowers. The colorful statue of Mahisashura in front of the bus park is a magnetic delight for the tourists! I had already burnt my ‘flat’ soles while walking barefoot from the bus park to the main temple of Chamundeshwari. As per our tour manager’s imprudent counsel I had left my shoes inside the bus coach to take all the heat from the red-hot-coal like road of the unforgiving noon. After that I enjoyed the 30 minutes long zigzag queue, even after purchasing a 30 bucks ticket (there is a more expensive ticket as well for devotees with heavy wallets) for ‘Special seva Darshan’ with two fresh blisters down my soles. I contemplated hard on elegant topics like ‘Bhakti’ but couldn’t get rid of continuous pushing from the back and odors of sweat filling the air around me. Subsequently, different boards showing rates of ‘Laddu Prasada’ and other sanctifying procedures stole my spiritual spirit. I just wanted to do a rapid-fire Darshan of the Goddess and come out of the temple with all tissues intact. P.S.- I was not so spiritually bankrupt in those days. Other tourist interests on Chamundi hill include- Mahabaladri temple, Narayanaswamy Temple, Mahisashura Statue, Nandi Statue, Lalitha Palace etc. 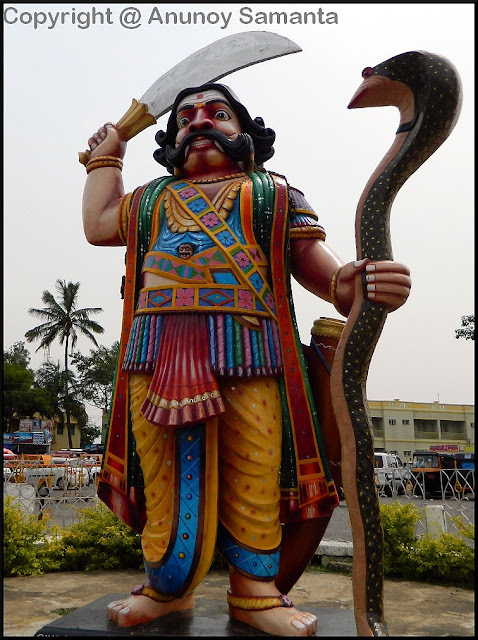 The colorful statue of Mahisashura with a sword in right hand and cobra in left, just in front of the bus park is magnetic delight for the tourists who want to be snapped along with the vicious demon. There are plenty KSRTC (Karnataka State Road Transport Corporation) buses plying between Mysore city bus stand to Chamundi Hill at regular short intervals. Remember the Darshan and Puja timings of Chamundeswari temple: 07:30 AM- 02:00 PM, 03:30 PM- 06:00 PM and 07:30 PM- 09:00 PM. If you’re an enthusiastic trekker and want to avoid the motorable road up to the hilltop, you may hike all 1008 stairs to climb the top! While descending we got a glimpse of the India’s 4thlargest bull (Nandi) statue carved out from a single stone. This 15 by 24 feet large Nandi statue on Chamundi hill is one of its kinds but the binding of being in a package tour took the lead and I could only snap a portion of this giant bull from my window seat after a desperate zooming. It was lunch time and my experiments with South Indian thalis continued. 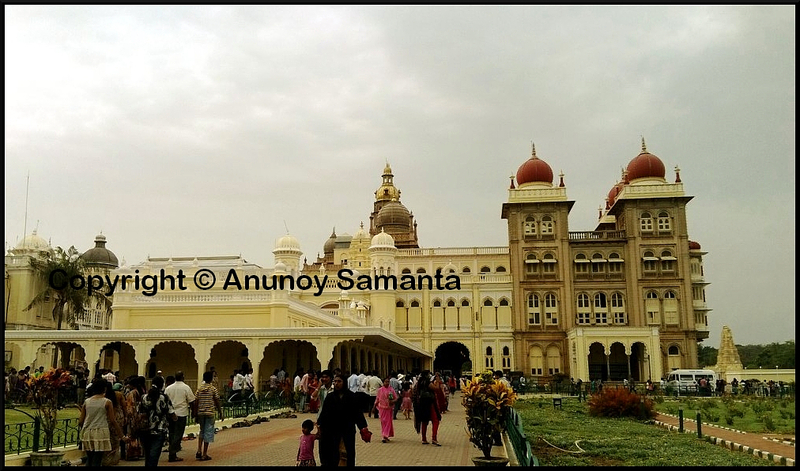 The Mysore Palace complex is so big that you may get exhausted to explore around on your feet. Although Mysore boasts of the title "the Palace City", yet when we talk of Mysore Palace it only refers to the official residence of Wodeyars (who ruled Mysore for more than 500 years), a living testimony to the jovial spirit of the people of Mysore and their kings, surviving all political turmoil, catastrophe and demolition, only to rise out of the ashes more glorious than ever! 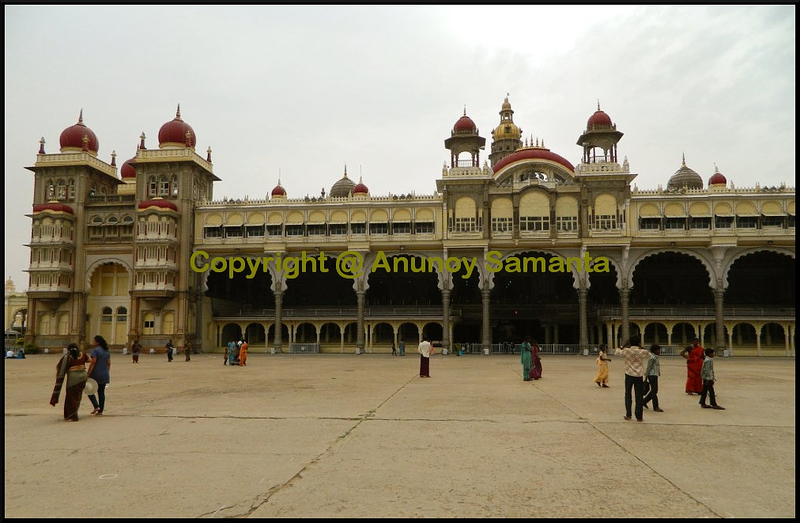 Our next destination after Chamundeshwari Temple was Mysore Palace. The Mysore Palace we find today is the 4th one to occupy the site since 1912, after its predecessor got burnt out in a fire in 1897. After you purchase the entry ticket and enter the Palace complex you can deposit your camera in the free camera custody counter as photography is strictly prohibited inside the palace. But I suggest you to roam around the porch, garden areas around the main palace and take photos of- the grand palace, tourists, temples and everything you find worthy on your way. Then you may deposit your camera and step on to the majestic palace floor. The palace complex is so big that you may get exhausted to walk around every nooks and corners on your feet, especially when you’re covering it with other sightseeing options in Mysore in a single day. So, you may opt for battery operated vehicles which will take you to all significant buildings and temples inside the Mysore Palace compound. You may also enjoy elephant/horse/camel ride to get the 'over the top' feel. Oh yes, shoes are not allowed inside the palace and seeing the polished floors of the Mysore Palace you’ll feel like a criminal if you ever thought it unfair to keep your shoes outside! The basic architecture of Mysore Palace consists of remarkable three storied stone building of fine gray granite, with deep pink marble domes dominated by a five storied 145 feet tower with a gilded dome mounted by a single golden flag. The Mysore Palace is one of the finest work of art of Indo-Saracenic architecture blending many diverse styles like Rajput, Muslim and Gothic to give birth to a magnum opus. The palace is set among meticulously laid gardens and has an intricately thorough elevation with a plethora of delicately curved arches, canopies, bay windows and columns in mottled style ranging from Byzantine to Hindu! The extravagant interiors of the Mysore Palace, in keeping with the flamboyant exteriors, are stuffed with elegantly carved doors, magnanimous pavilions, tantalizing chandeliers, delicate stained glass ceilings and ornamental murals portraying scenes from the Indian epics. The palace area includes twelve Hindu temples- Someshvara temple, Lakshmiramana temple, Shwetha Varahaswamy temple etc. It’s interesting to know that the Mysore Palace is the second most tourists attracting site, just next to Taj Mahal! Tourists can enjoy Sound and Light program at Mysore Palace from 07:00 - 08:00 PM on all days except Sundays and Govt holidays. At the end of this Sound and Light Show, palace illumination can be witnessed by tourists which is really click-worthy. On every Sunday and all public holidays Mysore Palace is illuminated from 07:00 to 07:45 PM. Dasara (Dussehra) is the grandest festival of Mysore. Every year during September-October, this Mysore Palace is the classic venue for the renowned Mysore Dasara Festival, during which cultural programs are conducted and elephants are decorated to parade with high-flying grandeur. I would anytime suggest you to spend at least half of the day in exploring the Mysore Palace, otherwise, somehow covering it in an hour is purely injustice to your traveling and disrespect to its legendary work of art. Brindavan Gardens is the most beautiful terrace garden of India, located alongside the Krishnarajasagara Dam. The blisters which I had conceived under my soles during the visit to Chamundeshwari Temple had ruptured discharging its evil contents on the delicate porch of Mysore Palace! I did acquire a sense of guilt but the relief from that ugly throbbing pain with every step had charged up my touring soul once again. We headed to the illustrious Brindavan Gardens, the most beautiful terrace garden of India, located alongside the Krishnarajasagara Dam. Brindavan gardens (the pleural is due to the fact that the garden is divided into north and south parts by a lake in between them, interconnected through a bridge) are meticulously laid out in three terraces, ornamented with numerous fountains, fig trees, vibrant flowers, topiary works, pergolas and gazebos. 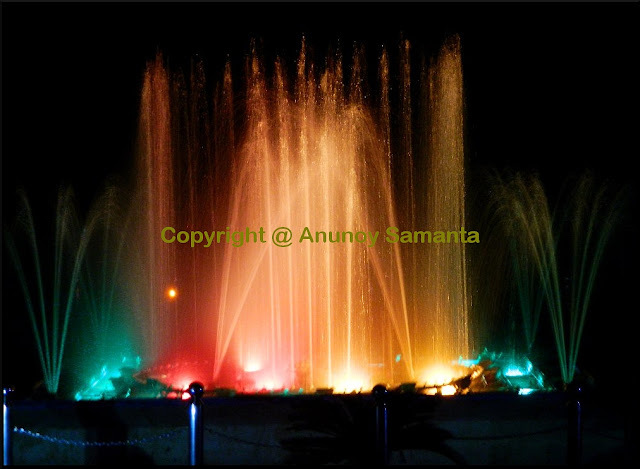 The main attraction of the Brindavan gardens is the Dancing Musical Fountain, where the water seems to dance harmoniously in various forms and shapes with the changing music and colors of light, and this whole process is computerized! We had reached Brindavan Gardens just before the fall of evening. Previously I was sad that I won’t be able to take clear shots in dim light but later I realized that it was the perfect time to visit Brindavan Gardens because all fountains get lively in their multicolored hues and also, the main attraction of the garden, the dancing musical fountain is played from 07:00 - 07:55 PM on all weekdays (07:00 - 08:55 PM on Saturdays and Sundays). Apart from the entry fee you need to take a separate ticket for camera. Different things you’ll come across in the Brindavan gardens are Arch fountains, Cross fountain, End fountains, Cross channel fountain, Radhakrishna falls, Umbrella fountain, Children’s park, Pyramid fountain, Inverted basket fountain, Goddess Cauvery Statue and the lake sandwiched between north and south Brindavan gardens where you can enjoying cruising on motorized boats. Brindavan gardens are currently looked after by Cauvery Irrigation Department and it seemed to me that they are unable to cope up with careless tourists who tend to throw their empty plastic bottles into fountain enclosures (Dammit, it is supposed to be a plastic free zone!). I liked the Sound and laser show in Hyderabad much more than the Mysore one. In front of most of the larger fountains you’ll find tourists standing in queue to get photographed, keeping the fountain as backdrop. Local photographers/cameramen are clearing those queues by clicking and pocketing 5-10 bucks from the tourists. You’ll also find a lot of cameramen begging you for your instant photo. You should reach the dancing musical fountain stadium fifteen minutes before seven, otherwise, the bridge connecting to the other side of the garden gets totally packed with thousands of hurrying feet, and you can’t imagine how boring it’s to tortoise-walk the entire length of that long bridge! The dancing musical fountain show is a ten-fifteen minutes affair and starts with patriotic track "Sare Jahan se Accha" and ends with some adrenaline pumping Bollywood remix. I may sound too critical but it is hard to be honest in a personal journal. I liked the Sound and laser show in Hyderabad (in Lumbini Park) much more than the Mysore one. We were tired enough for the day and nested for the night at River View Mayura Hotel at Mysore. Right now, I won’t comment on the accommodation and food quality there as I’ve decided to make a separate post for those at the end of this entire travelogue. The lukewarm shower invited a goodnight sleep soon after the dinner. Getting up from a comfortable bed is never easy, especially when it’s barely 04:00 AM. But, being in Rome I had to behave like a Roman. We had one more sightseeing destination left in Mysore and we made it at half past five before the day broke! 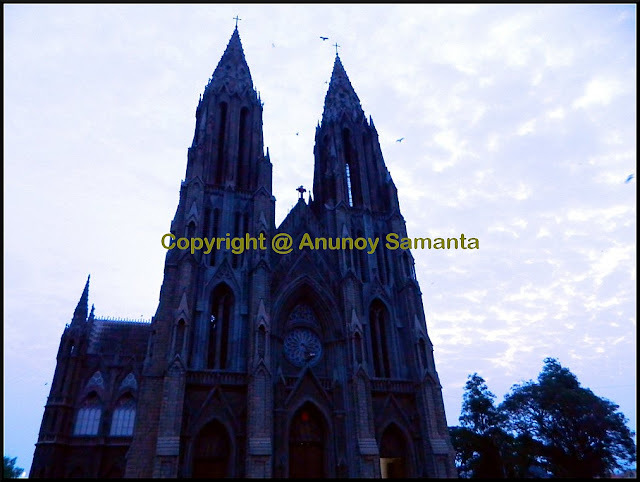 St Philomena’s Church is the third largest church in India, built in Neo Gothic style of architecture. It was the eighty years old St Philomena’s Church, the 3rd largest church in India. Inspired by the Cologne Cathedral in Germany it was built in Neo Gothic style of architecture. The twin spires of St Philomena’s Church are almost 175 feet high and seen from far away corners of the Mysore city! The main hall is equally beautiful as well as spacious to accommodate around 800 devotees at a time. This magnificent church remains open for the devotees and tourists from 05:00 AM to 06:00 PM. When we had reached there early Morning Prayer was on progress. It was definitely a good way to start my second day of the trip. We were enjoying the morning freshness while our bus headed to Nilgiris. The road journey from Mysore to Ooty was remarkably scenic and I've already blogged about it in the introductory post. I kept my hopes high for Ooty. Do visit back to read my travel tale of Ooty. for Bangaloreans this Cultural capital of South has become a Weekend hub.. nobody gets bored of it.. Such a beauty Mysore is.. isn't it.. I visited Mysore when was studying my +2 and I loved it. I love Mysore a lot, having stayed there temporarily for my first job! It is close to my heart and seeing your post brought back my memories.